The Gardeco breakthrough with fireproof clay products came in 2015 after 8 years of development. For 2016, we are launching CHIMALIN AFC, a unique range of clay fire products that carries a 5-year guarantee, only available from Gardeco. So yes, for the first time ever, you can fire a clay chimenea in the same way as you would a cast iron one, and build a large fire with peace of mind. Packing Size: 56.5cm length. 56.5cm width. 76cm height. Please read the following instructions and recommendations. Exercise CAUTION at all times for the safe enjoyment of a chimenea. Please retain these instructions. ALWAYS FOLLOW THE USER INSTRUCTIONS Failure to do so may result in personal injury or damage to property. 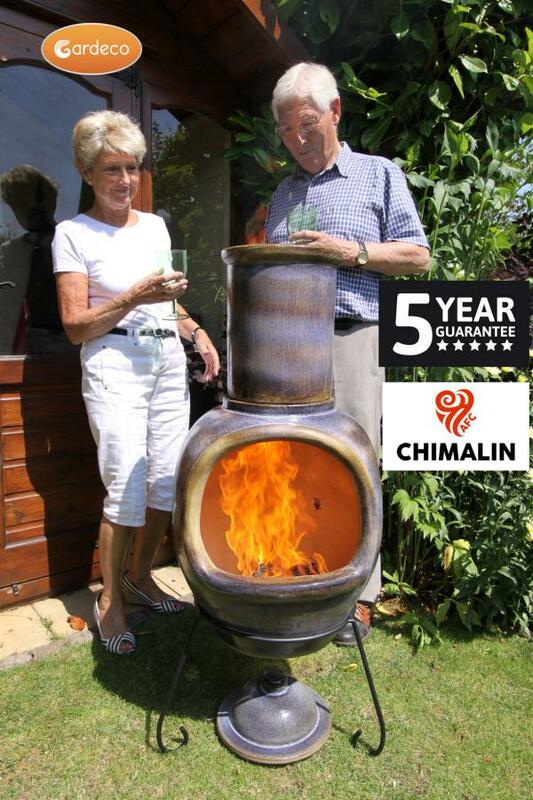 Â· PLACE your chimenea on a FLAT surface, NOT on a sloping surface where it might tip over. Â· This should be a NON-FLAMMABLE surface such as stone, gravel or bricks. Do not place on grass which may turn brown. DO NOT PLACE ON DECKING which may be damaged. You may protect decking with a Gardeco FLOOR PROTECTOR or use bricks or concrete slabs. Â· DO NOT place your chimenea near bushes or plants or under trees, the heat will damage the leaves and is a fire risk. DO NOT place your chimenea under an awning; it will burn or melt. Â· DO NOT place your chimenea near garden furniture, especially made of fabric or woven plastic, which may melt or catch fire. We recommend at least one metre three feet minimum distance. Â· DO NOT make a real fire inside a conservatory, summer house or garden shed. Chimeneas burning wood, coal or charcoal can only be used outside because fumes and gases from the fire are poisonous and dangerous to health. Carbon monoxide gas has no colour nor odour and is deadly. Â· DO NOT touch the chimenea when burning, the surface is hot and you will burn your fingers. Protect your hands with a Gardeco FIRE GLOVE. We recommend that gloves are used at all times. Â· DO NOT allow pets near the fire. Â· DO NOT allow children especially small children to be near, playing or running around the fire. Â· DO NOT over fuel the chimenea. If flames are coming out of the top of the chimenea, then the fire is too large! Â· DO NOT PANIC if fuel falls out of the chimenea or for any reason flames spread out from the fire, simply extinguish spreading flames with earth, sand or water or use a Gardeco FIRE BLANKET to smother the flames. DO NOT throw water on a real fire other than in an extreme emergency. Â· DO NOT use petrol or paraffin to start the fire. The best method is balled newspaper and dry kindling, such as Gardeco OCOTE sticks. The best fuel is dry wood. Â· NEVER LEAVE A BURNING CHIMENEA UNATTENDED Failure to do so may result in the fire spreading out of control and damage or destruction of property. Please ensure the fire is completely out before leaving the chimenea unattended. Â· DO NOT attempt to move any real patio fire while the fire is burning. Â· We advise against using a real patio fire when it is windy. Strong wind may TIP OVER a chimenea which is a fire risk. Wind may disperse burning material, which is a fire risk, particularly if the surroundings are very dry. Â· CHECK local ordinances/by laws to conform with fire risk prevention. Â· PLEASE be a good neighbour and be reasonable using your chimenea, keep smoke and noise to a minimum. Lisez les instructions et recommandations suivantes. Il vous faut Ãªtre dÂ’une extrÃªme prudence pour apprÃ©cier pleinement une cheminÃ©e. Gardez ces instructions. TOUJOURS SUIVRE LES CONSEILS DÂ’UTILISATION. sinon vous vous exposez Ã des blessures ou des dommages matÃ©riels. Â·Cela doit Ãªtre une surface NON INFLAMMABLE comme de la pierre, du gravier ou des briques. Ne la placez pas sur de lÂ’herbe qui pourrait sÃ©cher et donc sÂ’enflammer. NE PAS PLACER SUR UNE TERRASSE EN BOIS qui pourrait sÂ’enflammer. Vous pouvez protÃ©ger votre terrasse en bois avec une plaque de protection GARDECO ou utiliser des briques ou des dalles debÃ©ton. Â·NE PAS placer votre cheminÃ©e sous une avancÃ©e de type auvent, store ou marquise : cela pourrait fondre ou sÂ’enflammer. Â·NE PAS placer votre cheminÃ©e prÃ¨s de votre mobilier de jardin surtout sÂ’il contient des matiÃ¨res plastiques qui pourraient fondre ou sÂ’enflammer. Nous vous recommandons de maintenir votre cheminÃ©e Ã une distance de 1 mÃ¨tre minimum. Â·NE PAS faire un vrai feu Ã lÂ’intÃ©rieur dÂ’une vÃ©randa, dÂ’un abri de jardin. Les cheminÃ©es Ã bois, Ã charbon ou Ã charbon de bois ne peuvent Ãªtre utilisÃ©es quÂ’Ã lÂ’extÃ©rieur parce que la fumÃ©e et les gaz du feu sont toxiques et dangereux pour la santÃ©. Le monoxyde de carbone nÂ’a pas de couleur ni dÂ’odeur mais il peut causer de grave dommage Ã votre santÃ© pouvant aller jusquÂ’Ã la mort. Â·NE PAS toucher la cheminÃ©e lorsque le feu est allumÃ©, la surface est chaude et vous vous brÃ»leriez les doigts et les mains. ProtÃ©gez vos mains avec les GANTS ANTI-FEU de GARDECO. Nous vous recommandons de toujours utiliser ces gants. Â·GARDEZ vos animaux domestiques loin du feu. Â·GARDEZ les enfants et surtout les enfants en bas Ã¢ge hors de portÃ©e du feu. Il leur est formellement interdit de jouer prÃ¨s du feu. Â·NE PAS provoquer de grandes flammes intempestives : si les flammes sortent du conduit vertical de la cheminÃ©e, votre feu doit Ãªtre immÃ©diatement ralenti. Â·NE PANIQUEZ PAS si du matiÃ¨res embrasÃ©es sortent accidentellement de la cheminÃ©e, recouvrez les simplement de terre, de sable ou dÂ’eau ou utilisez la COUVERTURE ANTI-FEU de GARDECO. Â·NE PAS utiliser de pÃ©trole, de paraffine, ou dÂ’allume feu pour allumer votre feu. La meilleure mÃ©thode est dÂ’utiliser du papier journal ou des brindilles sÃ¨ches comme les brindilles OCOTE de GARDECO. Le meilleur combustible est le bois ou le charbon de bois. Â·NE JAMAIS LAISSER UN FEU SANS SURVEILLANCE car cela pourrait entraÃ®ner une propagation qui endommagerait ou dÃ©truirait vos biens. Assurez-vous que le feu est complÃ¨tement Ã©teint aprÃ¨s chaque utilisation. Â·NE PAS essayer de dÃ©placer un feu dÂ’extÃ©rieur si le feu nÂ’est pas complÃ¨tement Ã©teint. Â·Il est recommandÃ© de ne pas faire de feu quand il y a du vent. Un vent violent peut renverser votre cheminÃ©e ce qui reprÃ©sente un grand risque dÂ’incendie. Le vent peut disperser les matiÃ¨res incandescentes ce qui reprÃ©sente un grand risque dÂ’incendie, surtout en cas dÂ’environnement sec. Â· SOYEZ un bon voisin en utilisant votre feu dÂ’extÃ©rieur de faÃ§on raisonnable et veillez Ã maintenir la fumÃ©e et le bruit du feu Ã un niveau acceptable par votre voisinage. 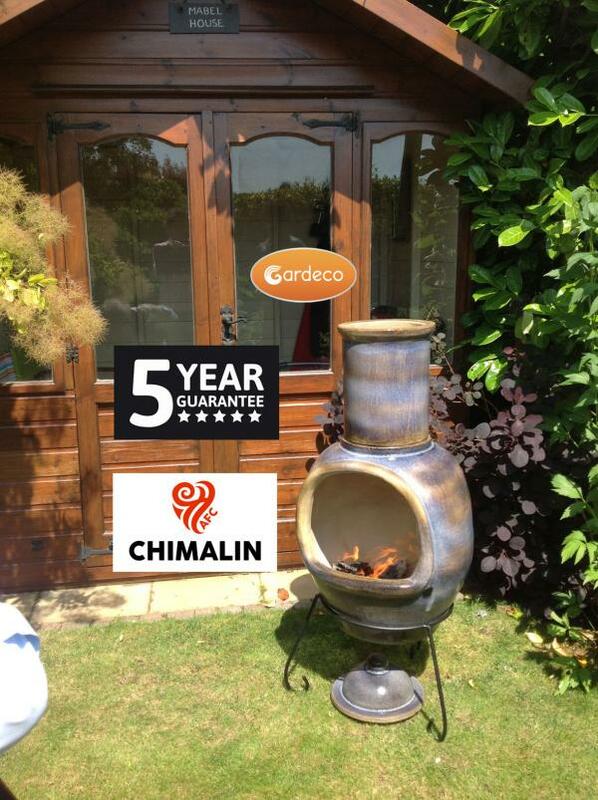 Â· Gardeco Chimalin AFC chimeneas all carry a five year warranty against thermal cracking because they are made from a special material which remains strong, durable and resists cracking even at high temperatures with normal use and fuels. Â· This warranty is limited to cracking due to thermal shock and excludes all other types of damage. The warranty excludes damage caused by being dropped, falling over, being blown over by wind, general misuse or any other type of damage to the structure or surface of the chimenea. Â· The warranty excludes damage to decking, furniture and other property. The warranty excludes crazing/crackling of the glaze finish which may occur with heavy use at high temperatures. Â·Les cheminÃ©es Chimalin AFC supportent toutes une garantie de 5 ans contre les chocs thermiques car elles sont fabriquÃ©es avec un matÃ©riau spÃ©cial qui reste robuste, durable et rÃ©siste aux craquements mÃªme Ã des tempÃ©ratures Ã©levÃ©es dans des conditions normales dÂ’utilisations. Â·Cette garantie se limite au craquement et fissure liÃ©s Ã un choc thermique et exclut tous les autres dommages. Cette garantie exclut les dommages causÃ©s par une chute, laissÃ© tomber par terre, renversÃ© par le vent, mauvaise utilisation gÃ©nÃ©rale ou tout autre type de dommages sur la structure ou la surface de la cheminÃ©e. Â·La garantie exclut les dommages causÃ©s au plancher ou terrasse, au mobilier et autres biens.La garantie exclut les fendillements/craquements de lÂ’Ã©mail liÃ©es Ã une utilisation intensive Ã des tempÃ©ratures trÃ¨s Ã©levÃ©es. Â·Pour valider votre garantie, complÃ©tez svp le formulaire de garantie qui se trouve Ã la fin de ce manuel dÂ’instructions et envoyez le svp par mail Ã info@gardeco.co.uk. Â· Chimeneas are like outdoor radiators are heated by the fire and gentle warmth will radiate out. It is not necessary to make a large fire, two or three logs are sufficient. Â· ALWAYS REMOVE the lid off the funnel when firing the chimenea, failure to do so will increase the temperature inside the chimenea and may cause the chimenea to crack or blow the lid off. 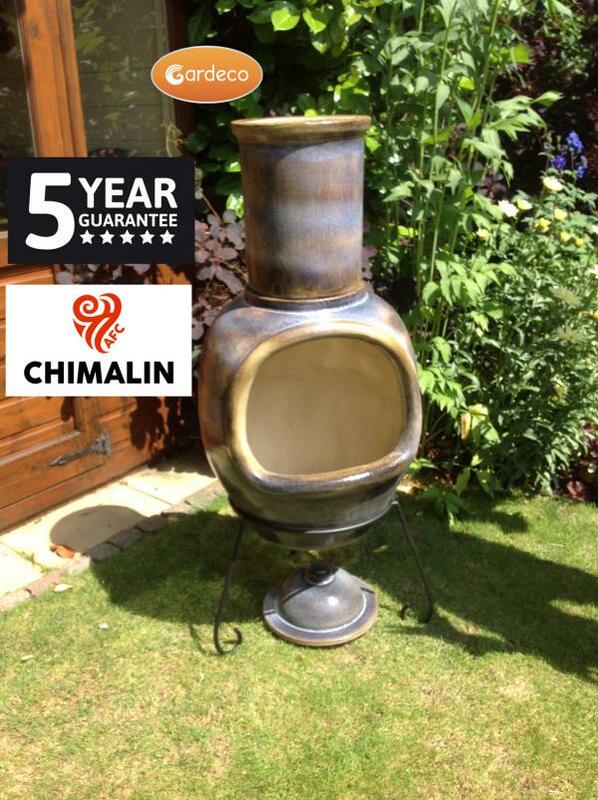 Â· Chimalin AFC chimeneas are fragile, so care needs to be taken to avoid damage, it may CRACK, CHIP OR BREAK if dropped or knocked over. 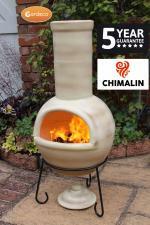 Â· To avoid dropping or knocking the chimenea over, handle the chimenea with care at all times. Do not Â“let goÂ” of the chimenea, particularly on hard floors, but lower it gently so there as little impact as possible. Dropping a clay chimenea, even from 5 cm/2 inches height may break, crack or chip it. Â· If transporting in a car, make sure it is not allowed to move around, we recommend attaching securely or packing. Â· High winds may tip the chimenea over, so be mindful of where it is situated and how to avoid this. Similarly, do not bang in to the chimenea with hard or heavy objects. Â· Do not throw fuel into a clay chimenea, impact may crack the clay or tip the chimenea over. 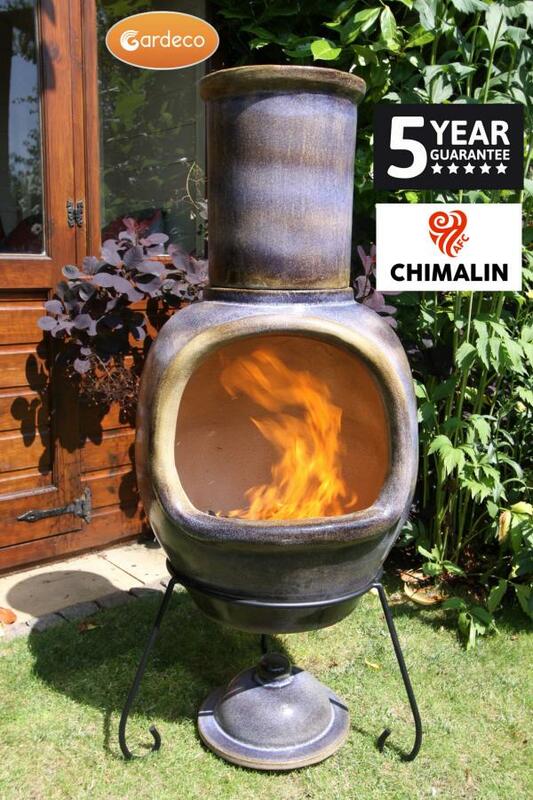 Â· Do not drag or move a chimenea on the stand, it may fall off and break. To move a chimenea, lift it off the stand, re-posi tion the stand, and lift the chimenea back on. Gardeco supply wheeled stands for larger chimeneas, so they can be moved around without having to take them off stands. Â· Special care should be taken with chimeneas with a removable funnel, remove the funnel to a safe place before attempting to relocate the bottom bowl. Â· Do not over-fuel the chimenea, if flames are coming out of the funnel, do not add more fuel. Â· Use dry wood logs or charcoal fuel. Wet logs will create a lot of smoke, use dry seasoned or kiln dried wood to minimise smoke. You may burn smokeless fuel in a Chimalin AFC chimenea. Â· You can cook on chimeneas. The belly acts like an oven, so barbecuing is quick and easy, so is using any of the Gardeco long-handled tools. Gardeco offer cast iron pots specifically designed to fit into the top of the funnel cooking stews and soups quickly. Â· Protect hands with Gardeco FIRE GLOVES when adding fuel. The more fuel is added, the more intense the heat, the larger the flames. Do not over-fuel the fire. Use a Gardeco POKER to reposition logs. Â· If the fire is slow to start, more air will help, use a Gardeco BELLOW to blow extra air into a slow fire. Â·Les CheminÃ©es en argile sont comme des radiateurs extÃ©rieurs, lÂ’argile est chauffÃ©e par le feu et il en Ã©mane une douce chaleur. Il nÂ’est pas nÃ©cessaire de faire un grand feu, une ou deux bÃ»ches suffisent. Â·TOUJOURS ENLEVER le couvercle du conduit de la cheminÃ©e lorsque les flammes sont en actions, ne pas le faire augmente considÃ©rablement la tempÃ©rature dans le foyer et peut provoquer des craquements sur la cheminÃ©e ou faire Ã©clater le couvercle. Â·Les CheminÃ©es en Argile sont fragiles, il faut prendre des prÃ©cautions pour ne pas les endommager. Les cheminÃ©es en argile peuvent CRAQUER, SÂ’EFFRITER OU CASSER si vous les laissez tomber au sol, si vous les renversez. Â·Evitez de laisser tomber la cheminÃ©e au sol ou de la renverser, vous devez toujours manier la cheminÃ©e avec soins. Ne la laissez pas glisser de vos mains surtout sur un sol dur mais dÃ©posez la avec soin pour rÃ©duire lÂ’impact et les chocs. Laisser tomber une cheminÃ©e au sol mÃªme dÂ’une hauteur de 5 cm provoquerait fissures, craquements, effritements. Â·Si vous la transportez dans une voiture, assurez-vous que la cheminÃ©e soit parfaitement calÃ©e et quÂ’elle ne roule pas. Nous vous recommandons de lÂ’attachÃ© solidement et de bien lÂ’emballer. Â·Un fort vent voire violent peut renverser la cheminÃ©e, soyez attentif Ã lÂ’emplacement que vous lui rÃ©servez. De mÃªme, ne pas cogner la cheminÃ©e avec des objets durs et lourds. Â·Ne pas jeter de bÃ»ches ou du bois dans une cheminÃ©e en argile, le choc peut faire craquer lÂ’argile ou renverser la cheminÃ©e. Â·Ne pas tirer ou dÃ©placer la cheminÃ©e lorsque Â‘elle est sur son socle : elle pourrait tomber et se casser. Pour dÃ©placer une cheminÃ©e,Ã´tezla de son socle, dÃ©placez le socle et reposez la cheminÃ©e sur son socle. GARDECO vous fournit des socles Ã roulettes pour des cheminÃ©es de grande taille afin quÂ’elles puissent Ãªtre dÃ©placÃ©es sans la soulever. Â·Une attention toute particuliÃ¨re doit Ãªtre portÃ©e sur les cheminÃ©es Ã©quipÃ©es dÂ’un conduit amovible, enlever le conduit et mettez le dans un endroit sÃ»r avant de dÃ©placer le foyer infÃ©rieur. Â·Ne surchargez pas le foyer de combustible (bois, charbon, etcÂ…). Si les flammes sortent du conduit de cheminÃ©e, ne rajoutez pas de combustible. Â·Utilisez des bÃ»ches de bois sec ou du charbon de bois. Les bÃ»ches humides crÃ©ent beaucoup de fumÃ©e, utilisez du bois sec pour la minimiser. Vous devriez brÃ»ler du combustible non fumigÃ¨ne dans une cheminÃ©e Chimalin AFC. Â·Vous pouvez cuisiner dans une CheminÃ©e CHIMALIN. LÂ’antre sert de four, on peut faire des grillades rapidement et facilement Ã lÂ’aide des ustensiles de cuisine dÂ’extÃ©rieur Ã longue poignÃ©e GARDECO. GARDECO vous propose une gamme de marmite en fonte qui sÂ’intÃ¨gre au conduit de nos cheminÃ©es pour prÃ©parer des plats mijotÃ©s et des soupes rapidement. Â·ProtÃ©gez vos mains avec les gants de GARDECO lorsque vous vous occupez du feu. Plus vous ajoutez du combustible, plus la chaleur est intense et plus les flammes sont grandes. Ne suralimentez pas le feu. Utilisez le tison Gardeco pour manipuler les bÃ»ches. Â·Si le feu est lent Ã dÃ©marrer, un surplus dÂ’air peut aider, utilisez un soufflet GARDECO pour accÃ©lÃ©rer le feu. Â·Pour enlever lÂ’Ã©tiquette de votre cheminÃ©e, imprÃ©gner avec de lÂ’eau, laisser au repos 10 mn et enlever en grattant dÃ©licatement. Alternativement, lÂ’Ã©tiquette est susceptible de brÃ»ler au premier feu. 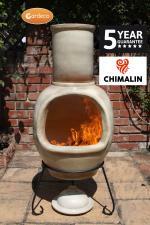 Â· Frost damage may occur when clay chimeneas are left outside in the winter without protection or a cover. Clay is a porous material and absorbs water. If the chimenea is water sodden and the temperature drops to below zero degrees Celsius, the water inside the clay will freeze, expand and crack the clay. Â· Protect your chimenea with a weather proof cover, this keeps the chimenea dry and protected from wind driven dirt and insects, plus a cover will reduce frost damage, but best is to bring it inside out of the frost, for the winter. Gardeco supply many covers suitable for all chimenea sizes. Â·Des dommages liÃ©s au gel peuvent se produire lorsque les cheminÃ©es en argile sont laissÃ©es Ã lÂ’extÃ©rieur pendant lÂ’hiver sans protection ou sans Ãªtre couverte. LÂ’argile est un matÃ©riau poreux qui absorbe lÂ’eau. Si la cheminÃ©e est chargÃ©e dÂ’eau et que la tempÃ©rature baisse en dessous de 0 degrÃ©, lÂ’eau contenue dans lÂ’argile va geler et faire craquer la cheminÃ©e. Â·ProtÃ©gez votre cheminÃ©e avec une housse de protection rÃ©sistante aux intempÃ©ries, elle maintient votre cheminÃ©e au sec et la protÃ¨ge des vents poussiÃ©reux et des insectes, rÃ©duit les risques de dommages liÃ©s au gel, mais lÂ’idÃ©al est dÂ’annuler son exposition au gel pendant lÂ’hiver. Gardeco fournit une gamme complÃ¨te de couverture et housse de protection idÃ©ale pour toute les tailles de cheminÃ©e. Â· The chimenea has excellent combustion so will leave very little ash residue, what ash remains can be removed by carefully upending the chimenea so the ash falls out of the funnel. Â· With use the glaze on your Chimalin AFC chimenea will change and discolour, and there will be blackening around the mouth or rim. The bigger the fires, the faster the finish will change. Â· The stand is made of steel and will rust. To reduce the likelihood of rusting bring the chimenea and stand inside or protect with a Gardeco weatherproof cover. Ideally, bring inside for the winter. Stands can be repainted. Â· Rust runs may mark flooring, slabs, and patios, so if you are worried about marking, protect your flooring. 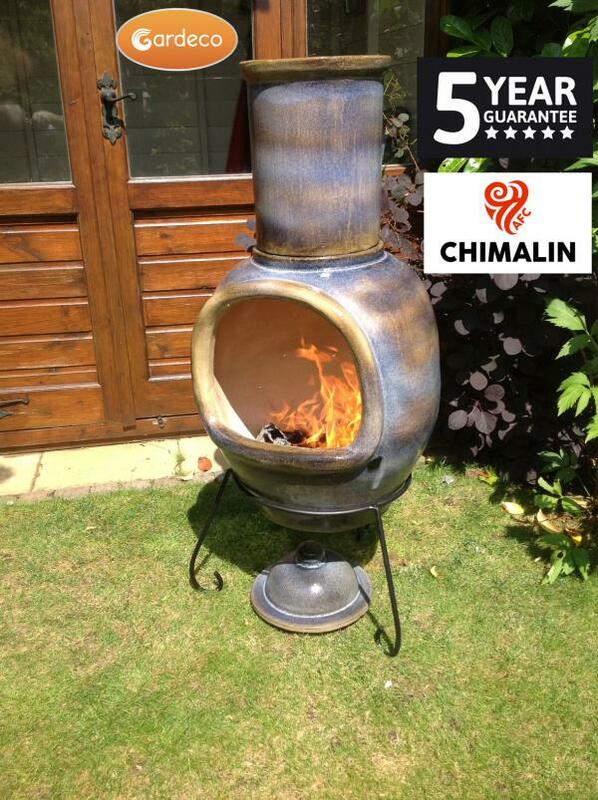 Â· A discoloured chimenea on a rusty stand is still fit for purpose and can continue to be used. Â·La cheminÃ©e a une excellente combustion et laissera que peu de cendres, ces cendres pourront Ãªtre re tirÃ©es par le conduit en retournant dÃ©licatement la cheminÃ©e. Â·A lÂ’utilisation, lÂ’Ã©mail de la cheminÃ©e Chimalin AFC changera dÂ’apparence et se dÃ©colorera, et elle noircira autour de la bouche ou au bord. Plus les feux sont importants, plus vite lÂ’apparence de la cheminÃ©e changera. Â·Le support est fabriquÃ© avec de lÂ’acier et rouillera. Pour rÃ©duire la probabilitÃ© de rouille, mettez votre cheminÃ©e et support Ã lÂ’intÃ©rieur ou protÃ©gez-la avec une housse de protection impermÃ©able Gardeco. IdÃ©alement, mettez-la Ã lÂ’intÃ©rieur pendant lÂ’hiver. Les supports peuvent Ãªtre repeints. Special care and attention is necessary when cooking on a chimenea or fire bowl to avoid contamination by smoke or soot. All cooking accessories MUST BE THOROUGHLY CLEANED BEFORE USE. Â· BBQ grills and accessories are coated with vegetable oil during manufacture but may have gathered dirt and dust therefore must be thoroughly washed in hot water and detergent, check all dirt is removed. Â· After cleaning and drying, cooking accessories are best lightly coated with vegetable cooking oil before use. After use, they must washed clean with hot water and detergent and coated with vegetable cooking oil before storing. NEVER USE MINER AL OIL. Â· If you do not oil cooking accessories they will rust, this could happen after first use. If you wash cooking accessories with water and donÂ’t coat with cooking oil rust can occur in a matter of hours. Â· After use the surfaces of the cooking accessories in direct contact with the fire will be covered in black carbon soot. Soot can be washed off with hot water and household detergent or washing up liquid. Be careful because black soot residues will mark surfaces, tea towels or washing up cloths. All soot must be removed before oiling with vegetable oil and storing. Des prÃ©cautions sont Ã prendre lorsque lÂ’on cuisine dans une cheminÃ©e ou un brasero afin dÂ’Ã©viter toute contamination par la fumÃ©e ou la suie. Tous les accessoires de cuisine DOIVENT ETRE SCRUPULEUSEMENT NETTOYES AVANT USAGE. Â·Les grilles BBQ et les accessoires sont recouverts dÂ’huile vÃ©gÃ©tale pendant la fabrication et ils peuvent donc accumuler de la saletÃ© et de la poussiÃ¨re et doivent Ãªtre scrupuleusement nettoyÃ©s Ã lÂ’eau chaude et du savon jusquÂ’Ã ce que les saletÃ©s soient complÃ¨tement Ã©liminÃ©es. Â·AprÃ¨s nettoyage et sÃ©chage, il est conseillÃ© de recouvrir les accessoires de cuisine dÂ’une fine pellicule dÂ’huile vÃ©gÃ©tale avant de les utiliser. AprÃ¨s utilisation, il faut les nettoyer Ã lÂ’eau chaude et au savon et les recouvrir dÂ’huile vÃ©gÃ©tale avant de les ranger. NE JAMAIS UTILISER DÂ’HUILE MINERALE. Â·Si vous ne graissez pas vos accessoires de cuisine aprÃ¨s chaque utilisation, ils vont rouiller et ceci peut se produire dÃ¨s la premiÃ¨re utilisation. Si vous nettoyez vos accessoires de cuisine avec de lÂ’eau et que vous ne les recouvrez pas dÂ’huile, la rouille peut apparaÃ®tre en quelques heures. Â·AprÃ¨s utilisation, les surfaces des accessoires de cuisine qui ont Ã©tÃ© en contact direct avec le feu seront recouvertes de suie noire. La suie peut Ãªtre nettoyÃ©e avec de lÂ’eau chaude et un dÃ©tergent ou du liquide vaisselle. Faites attention, la suie laisse des rÃ©sidus qui peuvent marquer vos surfaces et vos torchons. Toute la suie doit Ãªtre retirÃ©e avant de les recouvrir dÂ’huile et de les ranger. Do not cook on flames, if you do this there will be a soot residue on the food, which is unhealthy. Be aware wood is often treated with preservatives which are toxic and can contaminate the food. Â· When cooking use dry wood or charcoal, and allow the wood gas to burn off as flames to leave hot glowing embers, cook on the embers. Â· If meat releases fat onto the hot embers which makes a flame, move the meat away from the flame. Â· Keep a spray bottle of water handy to squirt on any flames. Â· Used a cast iron pan to grill meat rather than placing directly on a grill. Â· Alternatively wrap food in aluminium foil to prevent contamination. Ne cuisinez pas sur les flammes, si vous faites cela, il y aura des rÃ©sidus de suie sur vos aliments, ce qui nÂ’est pas bon pour votre santÃ©. Soyez conscient que le bois est souvent traitÃ© avec des conservateurs qui sont toxiques et qui peuvent contaminer vos aliments. Â·Lorsque vous cuisinez, utilisez du bois sec ou du charbon et laisser le gaz qui Ã©mane du bois brÃ»ler avec les flammes pour obtenir des cendres rouges sur lesquelles vous pouvez cuisiner. Â·Si la viande relÃ¢che de la graisse sur les cendres chaudes cela produira une flamme, dÃ©placez la viande de sorte Ã ce quÂ’elle ne soit plus en contact avec la flamme. Â·Gardez une bouteille dÂ’eau Ã portÃ©e de main au cas oÃ¹ vous ayez besoin de stopper une flamme. Â·Utilisez de prÃ©fÃ©rence une poÃªle en fonte pour faire cuire la viande plutÃ´t que de la placer directement sur la grille. Â·Vous pouvez aussi recouvrir vos aliments de papier aluminium afin dÂ’Ã©viter toute contamination. When cooking outdoors take care food is kept in hygienic conditions. Â· DO NOT leave meats in the sun or outside in hot weather, keep cool and covered with a clean cloth. Â· DO NOT leave butter in the sun or uncovered. Â· Keep meat and vegetables in separate dishes to avoid cross contamination with fluids. Â· Only bring food out into the garden/yard before cooking and it should be consumed after cooking as soon as possible. Food should be eaten while hot, immediately after coming out of the fire. Dispose of any cooked food not eaten. Â· MAKE SURE meat is thoroughly cooked. Â· When cooking accessories are taken out of the fire, they are hot and need to be put onto a hard non-flam mable surface, so the contents of the cooking accessory can be removed. Â· DO NOT place the cooking accessory on the patio, grass, earth or directly on the ground. Â· DO NOT put hot cooking accessories directly onto wood, furniture, plates, crockery or plastic surface. Â· Parts of the cooking accessories in direct contact with the fire may become covered with carbon soot. Make sure you do not contaminate your food with soot. Â· CAREFUL HOT! DO NOT TOUCH, steel and cast iron cooking accessories are very hot when taken out of the fire, do not touch with your fingers, protect hands with Gardeco FIRE GLOVES. Â· Cast iron cooking accessories can remain hot after use, so ALWAYS be very careful and cautious when handling cast iron cooking accessories. Â· DO NOT allow children to handle any of the cooking accessories. Â· NEVER leave a cooking accessory in the fire unattended. If you leave food in the fire, it will be burnt and inedible. Quand vous cuisinez Ã lÂ’extÃ©rieur, assurez-vous que votre nourriture soit conservÃ©e dans de bonnes conditions dÂ’hygiÃ¨ne. Â·NE PAS laisser les viandes au soleil ou Ã lÂ’extÃ©rieur par temps chaud, gardez les au frais et recouvrir dÂ’un linge propre. Â·NE PAS laisser le beurre au soleil ou non recouvert. Â·Gardez la viande et les lÃ©gumes dans des plats sÃ©parÃ©s pour Ã©viter la contamination par fluides. Â·Ne sortez la nourriture quÂ’au moment de la faire cuire et elle doit Ãªtre consommÃ©e le plus vite possible aprÃ¨s la grillade. La nourriture devrait Ãªtre consommÃ©e encore chaude juste aprÃ¨s Ãªtre sortie du feu. Ne pas conserver la nourriture qui a Ã©tÃ© grillÃ©e et qui nÂ’a pas Ã©tÃ© consommÃ©e. Â·Lorsque les accessoires de cuisine sont retirÃ©s du feu, ils sont chaud et doivent Ãªtre placÃ©s sur une surfacenon inflammable afin de retirer les aliments. Â·NE PAS placer les accessoires de cuisine sur le brasero ou la cheminÃ©e, lÂ’herbe, la terre ou Ã mÃªme le sol. Â·NE PAS poser les accessoires de cuisine chaud Ã mÃªme le bois, les meubles, les assiettes, la vaisselle ou sur une surface en plastique. Â·Les parties des accessoires de cuisson qui sont en contact direct avec le feu peuvent Ãªtre recouverts de suie. Assurez-vous de ne pas mettre de la suie sur les aliments. Â·ATTENTION CÂ’EST CHAUD ! NE PAS TOUCHER, les accessoires de cuisine en acier et en fonte sont trÃ¨s chauds lorsquÂ’ils quÂ’ils sortent du feu, ne pas les touchez avec vos doigts et protÃ©gez vos mains avec les GANTS spÃ©cial feu de GARDECO. Â·Les accessoires de cuisine en fonte peuvent rester chauds aprÃ¨s utilisation, alors soyez TOUJOURS prudent quand vous les manipuler. Â·NE PAS laisser les enfants manipuler les accessoires de cuisine. Â·NE JAMAIS laisser un accessoire de cuisine dans le feu sans surveillance. Si vous laissez la nourriture sur le feu, elle brÃ»lera et sera non comestible. Â· Cast iron accessories should be pre-heated for best results. Â· Always coat the inside with oil or butter of all accessories to prevent food sticking. Â· Butter tastes better than oil for waffles and pancakes. Â· A small brush is useful for oiling or buttering surfaces. Â·Les accessoires en fonte devraient Ãªtre prÃ©chauffÃ©s pour un meilleur rÃ©sultat. Â·Toujours badigeonner lÂ’intÃ©rieur de tous les accessoires avec de lÂ’huile ou beurre pour Ã©viter aux aliments de coller aux parois. Â·Le goÃ»t du beurre est meilleur que lÂ’huile pour les gaufres et les pancakes. Â·Un petit pinceau est plus efficace pour huiler ou beurrer les surfaces. Â·Une spatule plate est plus efficace pour retirer les aliments des accessoires. WHICH COOKING ACCESSORIES SHOULD I USE? Gardeco cooking accessories are specially designed for use in chimeneas, fire bowls, barbecues or outdoor fires. The materials used are suitable for the greater intensity of outdoor fires, with long handles to ensure ease of use without burning your hands. It is NOT ADVISABLE TO USE KITCHEN PANS OR POTS to cook on patio fires. Kitchen pans may be designed for fires of less intensity and coated with plastic based non-stick materials which may melt in patio fires. Gardeco cooking accessories are designed for cooking food on an open fire. Â· The Gardeco COOKING IRON is perfect for burgers, sausages, vegetables; it is multi-purpose. Â· The Gardeco TOASTIE IRON makes tasty sandwich toasties. Â· The Gardeco FRYING PAN is great for steaks, bacon, frying tomatoes and fried eggs. Â· The Gardeco POP CORN POPPER is great for entertaining children, who love watching popping corn. Â· The Gardeco PANCAKE PAN for making pancakes. Â· The Gardeco WAFFLE IRON for making waffles. Â· The Gardeco CHESTNUT PAN for roasting tasty chestnuts and can be used for cooking food wrapped in aluminium foil. Â· The Gardeco TOASTING FORK makes delicious toast and marshmallows, or to warm rolls or croissants. Â· The Gardeco PIZZA STONE is great for making pizzas the Italian way. Â· Your cast iron or steel chimenea may already be equipped with a SWIVELLING BBQ GRILL, made of either chromed steel or cast iron for barbecuing on your chimenea. These can also now be purchased separately from the chimenea. Â· The Gardeco SWIVELLING HOT PLATES AND FRYING PANS can be fitted in place of the BBQ grill on most steel and cast iron chimeneas. For more information on each cooking tool, please see our website www.gardeco.co.uk. QUELS ACCESSOIRES DE CUISINE DEVRAIS-JE UTILISER ? Les accessoires de cuisson GARDECO sont spÃ©cialement conÃ§us pour Ãªtre utilisÃ©s dans les cheminÃ©es, braseros, BBQ ou feu dÂ’extÃ©rieur. Les matÃ©riaux utilisÃ©s conviennent Ã des feux dÂ’extÃ©rieur intense, et sont Ã©quipÃ©s de longues poignÃ©es pour garantir une certaine aisance sans vous brÃ»ler les mains. IL NÂ’EST PAS recommandÃ© DÂ’UTILISER DES POELES OU MARMITTES DE CUISINE pour cuisiner sur des feux dÂ’extÃ©rieurs. Les poÃªles de cuisine peuvent Ãªtre conÃ§us pour des feux de moindre intensitÃ© et recouverts de matiÃ¨re plastique anti-adhÃ©rente qui pourrait fondre au contact du feu dans une cheminÃ©e ou un foyer ouvert. Les accessoires de cuisine GARDECO sont conÃ§us pour la cuisson des aliments dans un feu Ã foyer ouvert. Â·Le TOASTIE IRON de Gardeco permet de faire de gouteux sandwichs grillÃ©s. Â·Le FRYING PAN de Gardeco est idÃ©al pour les steaks, bacon, friture de tomates, Âœuf au plat. Â·Le POP CORN POPPER de Gardeco est idÃ©al pendant les animations pour enfants, qui adorent voir le maÃ¯s sauter. Â·Le PANCAKE PAN de Gardeco pour faire des crÃªpes. Â·Le WAFFLE IRON de Gardeco pour faire des gaufres. Â·Le CHESNUT PAN de Gardeco est idÃ©al pour griller des marrons gouteux et peut Ãªtre utilisÃ© pour rÃ©aliserdes cuissons dÂ’aliment enveloppÃ© dans du papier aluminium. Â·Le TOASTING FORK de Gardeco fait des toasts et des chamallows dÃ©licieux, et peut Ãªtre utilisÃ© pour rÃ©chauffer des viennoiseries ou des croissants. Â·Le PIZZA STONE de Gardeco est idÃ©al pour rÃ©aliser des pizzas Ã lÂ’italienne. Â·Utilisez la CHIM BBQ GRILL de Gardeco amovible pour les cheminÃ©es en argile, pour rÃ©aliser une cuisson de barbecue sur grille. Â·Votre cheminÃ©e en fonte ou en acier peut Ãªtre Ã©quipÃ©e du SWIVELLING BBQ GRILL, qui est fait soit dÂ’acier chromÃ© ou de fonte pour transformer votre cheminÃ©e en BBQ. Ils peuvent aussi Ãªtre achetÃ©s sÃ©parÃ©ment de la cheminÃ©e. All cooking accessories, whether supplied with the product or separately must be washed before first use to remove any dirt due to manufacture or packaging operations. We recommend you wash them before use every time subsequently, even if they were put away clean. All cast iron cooking accessories including BBQ grills and hot plates are coated with vegetable oil to stop rusting when you first receive them. After use, all cooking accessories need to be cleaned in soapy water to remove soot and food residue. Dry them well after cleaning and immediately coat them with vegetable oil before putting away. Failure to coat with vegetable oil will mean the accessory will start rusting. NEVER use mineral oil which is harmful to human health. For cooking accessories purchased separately from this product, follow the cooking instructions supplied with the packaging. If your chimenea is equipped with a swivelling cast iron BBQ grill, remember to remove and wash it thoroughly and coat it with vegetable oil before and after use. Put food directly onto the BBQ grill, either pre-heated or not. For pizzas, use the pizza stone. Use the multi-purpose tool provided to swivel the BBQ grill in and out. Never touch the BBQ grill with your hands while hot. A cast iron BBQ grill will remain hot a long time after use, even if taken out of the chimenea.